I went to Huntsville today with Cindy , Tonni and Jan, (who does not currently have a blog but will in the near future if we have our way as she is ONE Crafty Lady! LOL!! Upon returning after an exhausting but fruitful day (and just how fruitful will be addressed below).....I came home to my Sweetie having picked me a bouquet of the wild flowers that grow in the woods around our house!! And like a little boy so proud of his "arrangment".......What a sweetheart he is.....especially since he is color blind and doesn't "see" this color.....but he remembered me mentioning how they were all in bloom and how pretty they are!!! Awwww......I love my DH......I've got the best guy in the world!! As stated above, we left Trussville, early this morning heading for Laceys Springs, Alabama, to The Knitting Zone. After a beautiful drive through the country we reached our destination! Oh MY......What words can I use to describe all of us when we stepped over the threashold and encountered not just a few colors of "some" manufacturers.....but what must surely be every single color of every single yarn made!! I'm sure the look on our faces was quite comical....ESPECIALLY at the sock wall.....yes...that's what I said...the SOCK WALL!!! Oh my heart!!!! The picture is deceiving....this is a VERY LARGE shop....FILLED with yarn of every brand, weight, color and LOT'S of inventory! I think you would be hard pressed to have a project in mind and there not be enough yarn to complete your project. There was one entire wall dedicated to Koigu....of which I have NEVER seen!! The owner, Mary, could NOT have been nicer!! She not only opened her shop for us but spent time with each of us answering MANY, MANY questions, and was so VERY kind and patient with us all!! She even called up her goats for us to pet!! Baby Ivey has been bottle fed by Mary and is as tame as a puppy!! After a couple of hours and a few dollars lighter we headed for Huntsville for a bite to eat and a trip to Yarn Expressions. Not knowing what to expect, we didn't think it cosmically possible to find TWO fantastic shops in one day.....but OH MY.....were we in for a TREAT!!! At Yarn Expressions we found Meg and her wonderful assistant.....again, all four with our different sets of questions, etc., all met with patience and valuable information!! I saw quite a few yarns that I have seen online but not seen in local shops!!! This was SUCH a treat for me to be able to see and touch so many of the yarns I have read about!! I very much appreciated the yarn info Meg supplied me with regarding a particular project I had in mind to make!! After leaving Yarn Expressions we headed to the Chocolate Shop for a little fortification for the drive home and drove the "back way", through the country all the way back to Trussville....a GREAT drive on an absolutely gorgeous day with 3 of the best Gals a girl could go Yarn Crawling with!!!!! We will DEFINITELY be returning to BOTH these shops......plans are already in the works for a trip in early Fall, when all the great Winter yarns will be out and the drive will be filled with all the beautiful Fall leaves!! I can NOT say enough about BOTH these shops.....both with wonderful, kind owners that were quick to offer assistance, answer questions and share their expertise with us......yet both shops offer very different inventory and both worth checking out!!!! There was however, one tense moment when I was feeling a bit bad about all that I had purchased....because when faced with so many wonderful choices....well....decisions were hard to come by......I was afraid I had bought too much......but the good friend that Cindy is quickly got me back on track deeming that it was ALL necessary purchases, even NEEDED purchases and that I would have NO regrets about it!!! I LOVE CINDY!!!!! Stash Shot....which really doesn't look too bad in the bags.....I'll flash my portion of the stash later....after everyone is in bed asleep, when all is dark and no one can see I'll sneak my stash in the house.......and to my secret hiding place....NOT the place that my DH T.H.I.N.K.S. houses my yarn stash!!! LOL!!! If you are an Alabama Blogger and are planning on going to the 2007 SAFF (Southeastern Animal Fiber Fair), please feel free to take this button for your blog. Tonni was most gracious to make a button for those of us Bama Bloggers that will be attending. I believe the website is supposed to be updated and finalized some time in April. FYI, I did email the president of the organization to inquire about payment options for purchases (and you KNOW you are going to purchase!). I was told that most all vendors will be set up to accept Debit/Credit cards, and there are plans in the works to have an ATM machine set up onsite to accomodate those that may find themselves in need of additional funds. Hmmmm.......sort of like an ATM machine at the race track????? MIGHTY TEMPTING!!! LOL!!! There will be 100 plus vendors with everything from sheep to yarn and everything in between!! Going to be a fun trip!!!! If you plan to attend let me know.....we are going to try to set up a time and place (possibly at the fiber fair) for everyone to meet "face to face"......hoping to meet up with some of my blogging buddies from other states!!!!! I think the festival should make all attendees wear a badge with their blog name on it so we can identifiy each other!!! OR....maybe we should all see how creative we can be on our own!!!!! Contest Gifts and other Goodies!! The Post Woman came bearing gifts today!!! (Please disregard the book and jacket seen lying on the treadmill.....of COURSE I use my treadmill for walking!) LOL!! I was one of the winners in a blog contest she was having!! It was a GREAT idea for a contest!! Participants were asked to tell the "craziest" thing they ever did....which made me realize that at forty-something-ish....I have lived a pretty quiet life....hmmm...may need to rethink things before I start on the 50-something-ish age bracket!! Thankfully the contest was a random drawing!! LOL!! It started off with this pretty pink paper and a card which judging by the excellent quality and time that obviously went into making such a beautiful card.....was made by hand!!! Oh..OH...OOOOHHHHHH!!! Opal sock yarn... I have NEVER had Opal sock yarn and I absolutely can NOT wait to get started knitting!!!! The colors are "MY" colors too!!!! I just can't tell you how absolutely tickled I am with this yarn....and if THAT wasn't enough.....there were Sticky Pads....another weird coincidence??? I use sticky notes for EVERYTHING.....I LOVE them....for everything....and ALWAYS the decorative ones!! But this is getting downright freaky....because I have been meaning to pick up the Chibi's but the last couple of times I have looked for them the LYS was out!!!! AND.....to quote my nephew when he was a little boy...."Chocolate is my life"!!!! LOL!!! If you only KNEW what a chocoholic I am....but wait....maybe you did know since you knew everything else?????? LOL!!! 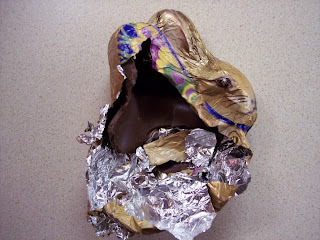 Considering Max's latest episode with the chocolate bunny it is deemed not safe to have chocolate around....anywhere.....so I should eat this chocolate....now....as in RIGHT NOW for lunch!!!! Besides.....chocolate is good for you....no REALLY....the more the better!!!!!!YUMMMMMM!!!!!!!! Lisa, I absolutely can not thank you enough for such a gracious, exciting gift!! 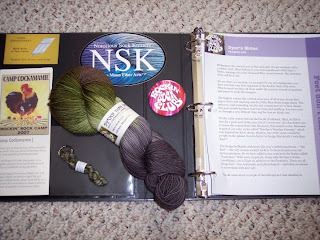 When your blog announced I had won sock yarn I had no idea I would receive so many wonderful gifts.....and everything is exactly what I have been wanting!!!! Many, Many THANKS!!!! Second Package: Computer part for my hubby......BORING.....!!!!! I guess I better check the mailbox now......after all this goodness, I'm sure there is a box full of bills waiting to be picked up! It's a MYSTERY I Tell Ya!!! Oh My....Be still my Beating HEART!!! It is (gulp).....STING!!! 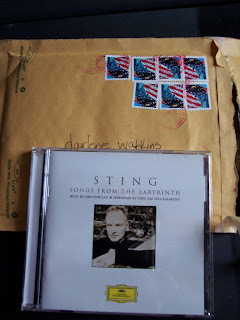 (Well, not Sting in the flesh, because if that were the case I wouldn't be in front of my computer right now!) LOL!! I received this package today....No Return address....the post mark is Birmingham, which doesn't narrow it down too much!! I CAN'T STAND IT.......WHO ARE YOU?????? I simply MUST KNOW.....so I can kiss your feet (a proper thank you when one receives the ONLY CD by Sting that is not in their much loved and frequently played collection).....which I have meant to buy this one for SOOO long but for one reason or another would forget (forgive me Sting)......to pick up while out shopping! To my secret benefactor: Many, Many, MANY thanks for your gift!!!! But really, you are going to drive me nuts if you don't reveal yourself!!! I am listening to my dream guy as I am posting......what soothing music!!! Oh, I just can't thank you enough!!!! I'm not worthy.....I'm not worth......I'm not worthy!!! I love you and thank you.....whoever you are!!!!!!!!!!!!!!!!!!! Not just for the CD.....but because you are obviously a very caring, generous person!!!!!! MWAH!!! Kisses to you!!!!!!!! Is he HANDSOME or what???? 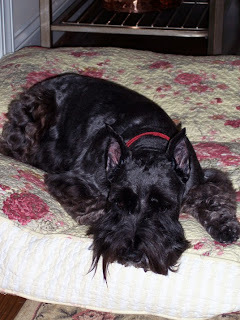 Picked up Max from the groomers (which is quite traumatic for him.....he has health issues so ANY trip to the vet is cause for panic). This USED to be a VERY CUTE Dove Fairy Bunny.....purchased for my Sister for Easter! She was SUCH a cute bunny.....had these little purple/pink colored fairy wings, the box had a sweet little story on the back about magic brooks in little fairy woods, etc. (After an unfortunate incident involving a pecan log and Max I decided to be SURE there was no chance of recurrence so I placed said Bunny in a tote bag....hanging in my closet to INSURE that in the event that I didn't close my closet door securely that he was not able to get the Bunny......so WE didn't have to go through the rather "gross" process of what one does after one's dog actually eats an ENTIRE pecan log)! WELL.......apparently the lure of chocolate was more than he could resist, I have door handles, not traditional knobs.....so I imagine he was able to reach his little paw up, hit the handle and open the door, I further hypothesize that Max was able to leap, grasping the tote off the hook and secure his treasure. Gory details involving turkey basters, bolus administration of hydrogen peroxide, resulting in multiple expulsions of said Bunny ensued. Note to Self: Stop thinking of others when it comes to enabling others with their special sweet treats! 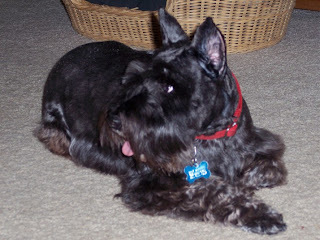 Fortunately, Max is fine, just has a tummy ache, not unlike when a kid eats too much junk according to our six figure income vet (compliments of Max, thank you very much). Oh.....and does anyone know how to get Chocolate out of OFF WHITE CARPET???????? My Yoshino Cherry Tree FINALLY has a few blooms on it!! This is the first year that it has bloomed, hopefully next year it will be loaded down!! Perhaps the reason for so few blooms is THIS!! Baby Cable Rib Pattern from Sensational Knitted Socks. Yarn: Purchased from an Ebay vendor: Oldfield Creek Sock & Yarn, no color name. PLENTY of left over yarn!! Knit on two size 1 circulars. A Wee Tiny Sock surprise from Laura!! I LOVE how the yarn magically changes colors for each part of the sock!! Thanks SOO much for thinking of me!! Knitting Update: I will finish the second St. Paddy's day sock tonight and hopefully have time to get my second Bloomin Fleet sock casted on and a few rows knitted! It's Officially The First Day Of SPRING!!!! YIPPEE!!!! It's also Tonni's BIRTHDAY today!!! Not sure how old she is.....just that she is YOUNGER than I am.....but I won't hold that against her!! LOL!! If you get a chance hop over to her site and leave her a Birthday wish! Also, while you are traveling....how about stopping by Cindy's Blog. We are slowly getting her blog up and running so please tag it to check back often as it will be changing all along. Cindy is working on her first pair of socks (I saw them yesterday and they are FLAWLESS)!! Also, I have another friend that we are going to get her blog set up this week and I'll be posting her link when it is up and running. Knitting: I am half way finished on my second St. Patrick's Day sock, will post a pic tomorrow. As soon as I finish this sock I'll get started on my second Bloomin Feet sock!! I was out running errands when my BF phoned to tell me she had received her Wee Tiny Sock!! I couldn't wait to get home and check my mailbox. Sure enough, there was an envelope waiting in the mailbox. Enclosed was THIS.....thoughtfully wrapped....further prolonging the mystery of what my Wee Tiny Sock might look like!! And who doesn't just LOVE opening presents???? Talk about a ray of sunshine on a MONDAY!!! Isn't this the most happy, cheerfull color??? Great Gran)......but I think anyone that reads Emily's blog feels the wonderful sense of family that comes through and feel like I know Great Gran as I do Emily!!! I am SOOO going to come down and meet you both one of these days!!!! Thanks Emily so much for a wonderful swap, and a very special thank you to Great Gran for such a cheerfull Wee Tiny Sock! I will think of you both every time I look at it!!! Ta DA!!! My Wee Tiny Sock......destined to go on a LONG trip today......all the way to ICELAND, from Alabama.....hmmm....wonder how long THAT trip will take!! LOL!! SUCH a cute idea this was and Kudos to Emily for such a great swap! Here are a couple of socks I am currently working on: The green sock is in a mock cable stitch the other sock is a K3, P1 rib. I will finish the green sock tonight, put the other sock on hold and cast on for my Bloomin Sock Pal's second sock. The green yarn was purchased on Ebay, vendor is Oldfield Creek Sock and Yarn. This is VERY nice, soft yarn and VERY reasonable. $ 14.95 for 440 yards, 80% Merino, 20% Nylon. He has a lot of really nice yarn listed on Ebay right now. 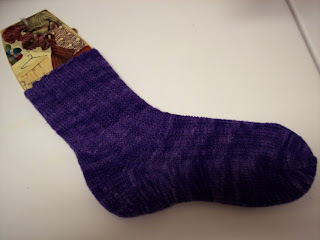 I'll have to hunt up the info on the other sock and will post when I have another sock update. Emily has assigned all the "Wee Tiny Sock" pals....and I have mine in hand!! Hmmm.....guess I'll plunder through my left over sock yarn to see what I can find for my Wee Tiny Sock! PRESSURE....must finish the sock and put in the mail this coming Friday! Great times and Sock Yarn For All!! WOW.....what a day!!! Tonni and I had the WONDERFUL opportunity to meet Laura today and what a day we had!!! We met at P.F. Changs for lunch, barely placed our order and we were all chatting away like three old friends!! Isn't it wonderful when you can meet someone new and feel so comfortable around them that you can truly be....YOU?!! THEN we hit the yarn stores!!!! (Happy, Happy, Joy, Joy). First in line was In The Making where many lively discussions were had regarding the wonderful selection of yarn, lot's of "ooooohing and ahhhhhhing" could be heard!! Seems we have the same taste......as all three of us chose the very same sock yarn!!! (I believe a challenge wa s thrown out for all to make socks and meet up at a later date to compare said socks)! Next stop was Knit Nouveau....where believe it or not......MORE sock yarn was acquired!! (Gotta love a fellow knitter who will tell you all the reasons you NEED more yarn!!) LOL!!! A mere 4 hours later we were ready to head to Tonni's for an evening of good conversation and knitting!! What a PRECIOUS person Laura is and how lucky we are that she was able to spend a bit of extra time in Birmingham.......just wishing she lived closer!!! After what seemed an incredibly short time I had to leave! Laura is Tonni's guest for the evening and considering what a sweetie Tonni is I know Laura will be in for a treat!! Of course, I am terribly jealous that they will have all night to knit together.......but I see a get together in the not so distant future for the three of us!!! 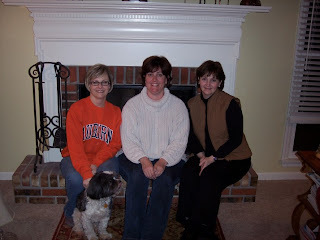 Isn't it wonderful when three folks who previously never knew the others existed could meet through a blog, become friends and that wonderful friendship carry over to meeting in person!! Already looking forward to next time!!!!!!!!! Wee Tiny Sock Swap....DO IT!!! 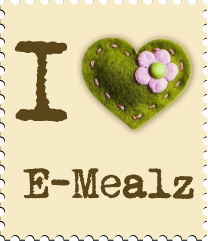 Check out Emily's Blog for the details.....but in a nutshell: Do you have scrap sock yarn? Got a 39 cent stamp? Got an envelope? THAT'S ALL YOU NEED!! Emily even has the wee tiny sock pattern on her site!! This is a NO STRESS sock swap!!! Check it out and sign up today, Friday is the deadline to sign up!! I received my Blue Moon Rockin Sock Club kit today and I must admit, I am a bit underwhelmed....maybe the anticipation for so long caused me to have visions of grandeur that no one could possibly provide!?! George Clooney showing up at my door to present a box so heavy with free yarn that even he could barely hold up??? Rountrip airfair to the Blue Moon facility??? Oh the possibilities!! LOL!! (visions of grandeur here I'm tellin ya!!). When I was contacted by BMFA to sign up for the second time, following their bank debacle, I was told there would be a very nice gift enclosed with the first shipment....their way of compensating everyone for all the trouble they went through. For some reason I was dreaming of yarn (reference above visions of grandeur)......but the 10% discount coupon will come in handy when I get ready to place another order....which will be soon I am sure!! (who am I kidding.....I'm already making my list!!) LOL!! The pattern is one I will have to work/study on....a toe up pattern, but, I have been wanting to learn to do the toe up socks so this may be the nudge that I needed to get going on learning something new. To date, I have only knit the most basic of socks and this pattern is going to require practice on my part before attempting to use my designated yarn. A lot of knitting terms that I haven't used in the past....but I am ready for a sock challenge!!! 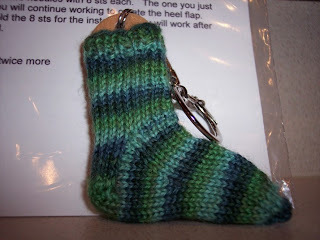 I love the little emergency sock yarn keychain!!! Too cute! Mine needs a bit of work on it (loose yarn tucked underneath)...but maybe in doing a bit of repair work, I can figure out how to make them and use my scrap yarn to make matching keychains for all the future sock kits!! In closing, IF George Clooney couldn't PERSONALLY deliver my Blue Moon Sock Kit......then I guess that is O.K. I'm glad to get my first kit and already looking forward to the next one!!! Ode 'To Peeps and A Bloomin Sock!! Oh, how I love your smooshy, gooshy goodness. How you glisten, all lined up in a row! 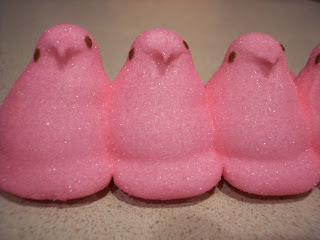 for me to bite your little heads off before devouring your smooshy, gooshy little bodies! AND.....ONE BLOOMIN SOCK IS COMPLETED!! Well....I am having a bit of difficulty with getting the toe finished....I seem to have a tiny bump on one end......I have left a long tail of yarn attached and will work on getting this issue resolved. Worse comes to worse, I'll tink the Kitchner and close the toe with a drawstring toe.....but I like the look and feel of the kitchner toe. 21 years ago today I married the greatest guy in the world!! After our first date, I knew we would be together forever. Not that I decided to "rope him in" mind you, but just an incredible peace in my soul that I didn't need to worry....that he was the one...... that we would be together forever!! 21 years is a long time, but it has FLOWN by and it makes me incredibly sad that it has gone by so fast!!! I want to go back and do it all again......and ANOTHER 21 years to boot!! DH took off from work today......we were planning a day....but weather is bad, so we will enjoy a day together doing nothing here at home, part of which I am sure will be spent in the basement listening to the weather radio.....but that's o.k. too....just being together is enough for me! !